Hammond Organist Brian Auger has agreed to step in and save a string of the Blues Project concerts announced earlier this year. See details below. The Blues Project is a group of old friends, delivering high quality British rhythm’n’blues the way it was always supposed to sound. 30 – Kaiserslautern, Kammgarn-Blues-Festival – feat. BRIAN AUGER NEW! 15 – Regenstauf, Jahnhalle – feat. BRIAN AUGER tickets NEW! 16 – Erfurt, Gewerkschaftshaus – feat. BRIAN AUGER tickets NEW! 18 – Salzgitter, Kulturscheune – feat. BRIAN AUGER tickets NEW! 20 – Bochum, Zeche – feat. BRIAN AUGER tickets NEW! 23 – Stuttgart, LKA Longhorn – feat. BRIAN AUGER tickets NEW! This has elements of the old Apollo Theatre in Harlem Rhythm and Blues Revues of the early 50s and the procession of solo singers and instrumentalists keeps it interesting and fascinating. In 1982 the Rock and Blues Circus toured Germany with Jon, Colin, Pete, Chris Farlowe and others, while in the UK another line-up with Chris, Brian Auger, Colin, Spencer Davis and Pete went out under the name of Blues Reunion. Other old friends like Miller, Zoot and Tony Ashton were brought into this. Various other band names were used along the way, Endangered Species, Daddy and the Steamers etc but in essence the success of the shows lies in the drive and feeling produced by these virtuoso old friends and in the fun they have in doing it. His first name band was the Keef Hartley Band. He wrote much of the material they recorded on their several successful LPs and was the impressive frontman when they appeared at Woodstock in 1969. Miller went on to be featured with Savoy Brown, Stan Webb’s Chicken Shack, Blood Sweat and Tears, Marc Bolan’s T. Rex, Mick Taylor, Donovan, Mountain, the Spencer Davis Group, Pete York’s Super Drumming TV series, Jon Lord’s orchestral projects and used to be with the British Blues Quintet. He now leads his own Miller Anderson Band on tour in Europe and continues to compose original songs for his performances. One of the most exciting singers of the 60s and 70s with the legendary Stone The Crows, also Peter Green, Steve Howe and Taj Mahal. The raw power of her singing and her stage presence have not diminished one iota over her long career and whether she is on the road with Dave Kelly, Chris Farlowe or the British Blues Quintet she earns standing ovations from the fans of all ages. Began his bass-playing career with Alexis Korner, where he learned the roots of the blues. His group Back Door was a highly original concept and enjoyed great success. He went on to be part of Charlie Watts Rocket 88, David Coverdale’s Whitesnake, the Olympic Rock and Blues Circus with Jon Lord, Pete York and Chris Farlowe. 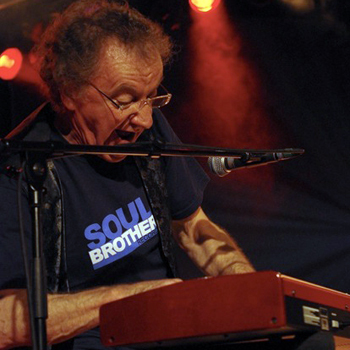 He also toured with Brian Auger, Chris Rea, Frank Diez and the Spencer Davis Group. Colin also appeared with Pete York in the Super Drumming TV series. Became one of the first Hammond organ soloists and a highly individual singer with his Big Roll Band in the 60s. His recording of Big Time Operator was a 60s hit. Often voted the favourite band of other stars of the time, Zoot’s mix of blues, soul, jazz and raving lunacy were perfect for the era. Andy Summers (later of Police) was his guitarist and Zoot later collaborated with Alexis Korner and Eric Burdon. He has also acted in British films and TV and his personality has enlivened projects with Alan Price, Bobby Tench, Humble Pie and his own British Blues Quintet. Please record the shows. The lineup is tremendous!! Congratulations for this project that I’m sure will be full of success as has been your brilliant career. A team full of stars of the blues, especially Maggie Bell of which I am a big fan. Now, the traditional request: São Paulo is with open arms and will extend red carpet to welcome you soon. Toast us brazilians with your talent. I know it’s a BIG ask but please, please, please bring this to Australia. Or at least put the show on DVD…..
Wow… Jon Lord and Maggie Bell in the same band?!!! Who would’ve thunk it? Too awesome! US tour dates please!!!!!!!! Jon should call Ritchie and see if his wife will let him come out and play. please, please bring this line-up to southern France!!!!!!! No matter which type of music is his base: ever since I heard Doogie White sing in your concert, I am SURE that he deserves a place in any formation you conceive! The way he made me shiver when he sang his part in Essen still wakes me up at night! Good luck with your blues project! Places I don’t know and so far away. Missing you longtime. Please tell me there will be some dates in the UK, preferably Scotland…….please, please, please! can we know a little bit about the program? thanks a lot, see you in Paks, Hungary in July! Great news! Having heard (and seen) him with the Hoochie Coochie Men on the CD/DVD “Danger White Men Dancing”, all I can say, is that we are getting back the magic of his Hammondness, that was missing the last few “classical” years. Don’t get me wrong, I loved Sarabande and Pictured Within but I am a Blues/Rock person! Wow – what a line up. I really hope you find time to visit Dublin on your travells. So pleased you guys are all giving so much enjoyment. To see Maggie live would be fantastic – in my mind the greatest female blues singer of them all. What a Great performance in Rottweil! It was the best show, Rottweil ever seen! Concratulations to all members of that great band!! During the gig I hoped, Maggie will perform “Sunset Cowboy” (Stone the Crows). May be next year in Rottweil? I hope so!!! Any dates here in the US? All the best to the band. Love the music. I am a blues keyboard player from Chicago, and am hopeful to see the bands. Great Jon! Great project! Great band! I Hope to see you in Italy! please….. come!!! Hi Jon, I´m missing Chris Farlowe on Vocals. That would be a great Completion of the Vocal-Section with Maggie. when you come in Italy? I’m very, very glad to see you and your band on November the 15th in Regenstauf. Jon! saw you a few times in the ’70s and once in the late ’90s when you were with that group….anyway, we here in the US have not forgotten you. We would love for you tour here again. Blues or Orchestra. Thanks for all the music you have provided for us to enjoy. I was looking up the lineup for Deep Purple’s US tour this year and read that Jon wasn’t with them anymore and is leading up this project. I am super excited and happy for him with this and give full support! Pleeease come to US! San Francisco would love to have you! This evening in graz (30.6.2011) was wonderful! Congratulations! it was just great – thank you for this wonderful performance in graz! it was a great concert in graz, i’ve been there and i really liked it. The concert was brilliant at Paks Gasztroblues Fesztival.There was a sad, moment of the concert,when one of the cameramen was too close to you and you were wery angry about it. The second sad moment was, that my JL Blues Project T-shirt couldn’t be dedicated by you. How about playing Bull’s Head Barnes? Small venue I know, but intimate! One of Zoot’s favourite places. QUE DEUS TE ABENÇOE ASSIN COMO ME ABEMÇOU……..UM GRANDE ABRAÇO….. LORD……..
QUE DEUS TE ABENÇOE…………..UM GRANDE ABRAÇO….LORD…..
Dear Jon, I am a fan of your talent and respectively of your music since the very first beginnings of your career and I have sucesfully passed this pation for you to my children, 19 / 17 and 8. We wish you a fast recovery and please come back on stage soon because we need you, Beethoven of our times. Meinrad. This band should go on the X Factor just to show them what entertainment is all about….Gary Barlow. Well done to Brian Auger. whats the reason for cancelling the concert in berlin at huxleys? what a pity! is there no chance to see you with the project in berlin, maybe next year? and wish you all the best, stay tuned and maybe we see you next year. When in Italy on tour? ?